Received January 3, 2019; Revised February 18, 2019; Accepted February 25, 2019. This study examined the effects of flexible flatfeet on the accuracy of knee joint motions in closed and open kinetic chain tasks. Twenty-four healthy participants were recruited for this study. The subjects were divided into two groups using a navicular drop (ND) test: flexible flatfoot group (n=12, male: 6, aged 22.00±2.22 years) and age-matched control group (n=12, males: 6, aged 22.17±1.53 years). The accuracy of knee motion was measured quantitatively by tracing through the flexion and extension motion of the knee joints in the closed kinetic chain and the open kinetic chain. There was a significant difference in the accuracy index between the groups in closed kinetic chain task, but there was no significant difference in the open kinetic chain task. In addition, there was a significant difference in the accuracy index between the closed kinetic chain and the open kinetic chain task in the flexible flatfoot group. In addition, a significant negative correlation was observed between the ND and accuracy index in the closed kinematic chain task, but there was no significant relationship between the ND and accuracy index in the open kinematic chain task. Flexible flatfeet can affect the accuracy of the adjacent joints, such as the knee joint in the closed kinematic chain. Flatfeet show excessive mobility of the middle part of the feet due to lowering of the foot arch and pronated feet. In addition, weakening of the ligaments and plantar fascia causes excessive compensating action of the extrinsic muscle due to the lack of ability to disperse the shock absorption to the weight load. This can easily lead to fatigue, pain, and overuse syndrome.4,6 In addition, flatfeet affect the sole contact surface and mobility, causing changes in the somatosensory functions and affecting the muscle functioning to maintain the stability of the feet.4,7 It is well known that the instability of the feet and soles can indirectly cause alignment deformity and mechanical changes of the knee joint, hip joint, and back.1,7-9 However, there is little research for the effect on performance of adjacent joints. On the other hand, a kinetic chain is divided into an open kinetic chain and closed kinetic chain. Open kinetic chain exercises use single-joint movements and are performed on the free distal joints under non-weight conditions. Certain segments can be separated for enhancement and evaluation purposes. Closed kinetic chain exercises use multiple joint movements, and the distal segment is fixed and performed in a weighted posture. Therefore, each joint considers the motion of the other interconnected segments and affects the other parts.10-13 In particular, closed kinetic chain exercises of the lower limb, such as the squatting, causes a contraction of the adjacent muscles for flexion and an extension of the ankle joint, knee joint, and hip joint and requires stability of the distal segments of the feet and ankles.14,15 On the other hand, little is known regarding whether the open or closed kinetic chain task of the knee is influenced by flexible flatfeet. This study examined effects of flexible flatfeet on the accuracy of knee joint motion in closed and open kinetic chain tasks. In addition, this study identified whether there was a correlation between the degree of navicular drop and the accuracy of the knee joint motions in each chain kinetic task. Twenty-four healthy participants with no history of neurological, orthopedic injury, surgery, or pain in the lower extremities were recruited for this study. The subjects were divided into two groups using a ND test: flexible flatfoot group (n=12, male: 6 female: 6, aged 22.00± 2.22 years) and age-matched control group (n=12, male: 6 female: 6, aged 22.17±1.53 years). The ND test was conducted to identify subjects with flexible flatfeet. First, the navicular tuberosity was marked in the sitting position with the feet fixed but nonweight bearing, and the vertical height from the floor was then recorded. Second, the navicular tuberosity height was measured in the standing position and compared with the height difference in the sitting position When the difference was more than 10 mm, it was classified as flexible flatfeet. The intra-rater test-retest reliability of the ND test was high with ICC= 0.930.16,17Table 1 lists the demographic data. All subjects understood the purpose of the study and provided written, informed consent prior to participation. The study protocol was conducted according to the principles of the Declaration of Helsinki and approved by the Institutional Review Board DHUMC-D-17017-FIN-02 of Daegu Oriental Hospital of Daegu Haany University. FFG: flexible flatfoot group, ND: navicular drop. For the tracking task, the subjects were instructed to follow the red target baseline proceeding to the sine wave displayed on the computer screen as accurately as possible using the knee flexion and extension motion. The angle of knee joint that was moved during tracking was between 0° and 90°. Each tracking task was performed for 15 seconds and the accuracy of knee joint motion was measured as the average of 3 repeated measurements. The knee joint tracking task was performed in both the open and closed kinetic chains. The open kinetic chain task was carried out sitting in a high chair to maintain non-weight bearing with a free foot. In the closed kinetic chain task, the subjects performed knee flexion and extension repeatedly in weight bearing with a fixed foot (Figure 1). Tracking task of knee joint: (A) open kinetic chain, and (B) closed kinetic chain. The p-value was measured as the root mean square (RMS) value between the vertical lines at the upper and lower apexes of the sine wave, and the E value was calculated as the RMS error between the sine wave line and the subject’s movement. The size of P was based on the scale of the vertical axis, which is the range of knee motion of each subject. A high AI score means that performance of knee joint is accurate. Statistical analysis was conducted using the SPSS 23.0 for Windows program. A Kolmogorov-Smirnov test was used as the normality test. A Mann-Whitney test was applied to examine the differences in AI between the groups, and the Wilcoxon signed rank test was used to compare the AI between the open-chain and closed-chain kinetics tasks in each group. The Spearman rank test was used to examine the correlation between the ND degree and AI in each chain position. A p-value< 0.05 was considered significant. In the closed kinetic chain task, there was a significant difference between the flexible flat foot group and control group. On the other hand, in the open kinetic chain task, there was no significant difference between the flexible flat foot group and control group (p< 0.05). In addition, there was a significant difference in the open kinematic chain and closed kinematic chain task in the flexible flatfeet group (p< 0.05) but there was no significant difference in the control group (Table 2). AI: accuracy index, FFG: flexible flatfoot group. A significant negative correlation was observed between the ND and AI in the closed kinematic chain task (p< 0.05) but there was no significant relationship between the ND and AI in the open kinematic chain task (p> 0.05)(Table 3). The present study compared the accuracy of knee joint motion according to the kinematic chain tasks in subjects with flexible flatfeet. In the closed kinematic chain task, a significant difference in the accuracy of knee joint motion was observed between the flexible flatfoot and control groups. In contrast, there was no significant difference in the open kinematic chain task. In addition, there was a significant difference in the accuracy of knee joint motion between the closed and kinematic chain task in the flexible flatfeet group. On the other hand, there was no significant difference in the control group. The ND and accuracy of knee joint motion showed a negative correlation in the closed kinematic chain task but there was no correlation in the open kinematic chain task. In the closed kinematic chain, the movement at one joint requires motion of the neighboring joints and segments, and the distal segment is usually fixed to a supporting surface.10 Therefore, stability is required from the supporting surface as body movements occur on the distal segments.23 The stability of the distal segment in the closed kinetic chain exercise could reduce the sheer force of the body joint and provide stable movement.15 Therefore, the stability of the foot, which is in direct contact with the ground, is very important for a closed kinematic chain using the lower limb. On the other hand, flexible flatfeet may induce increased pronation of the subtarlar joint, resulting in instability of the foot and ankle. Furthermore, instability of the base of the support may cause impaired function.24 Tahmasebi et al.25 reported that the stability and center of the pressure velocity were greater in flat feet than in normal feet when standing on both feet. Recently, Sung et al.9 measured the sway of the head, lumbar, lower thorax, and upper thorax in the 3-D axis when standing on one leg for 20 seconds on a flat foot and a normal foot, the subjects with flatfeet showed larger sway than those with normal feet. In addition, Hertel et al.26 reported that pronation of the foot due to weight bearing of the flexible flatfeet decreased the muscle activity of the gluteus medius, vastus lateralis, and vastus medialis during squatting, and the closed kinematic chain task of the knee joints could reduce the muscle coordination. Similarly, the results of the present study showed that the knee joint movement function of the subjects with flexible flatfeet was reduced in the closed chain task. These results may not have provided sufficient stability in the support surface of flexible flatfeet during the closed kinematic chain tasks. This study examined the accuracy of knee joint motion during closed and open kinematic chain tasks in subjects with flexible flatfeet. The flexible flatfoot group showed different accuracy of knee joint motion in the closed kinematic chain task than the control group. In particular, the accuracy decreased with increasing ND. Therefore, flexible flatfeet may affect the function of the adjacent joints, such as the knee joint in the closed kinematic chain. Furthermore, these characteristics will lead to a decrease in functional movement. This is an important clinical finding regarding the dysfunction of subjects with flexible flatfeet. In particular, clinicians should attend to our finding when subjects with flexible flatfeet perform exercises of closed chain in rehabilitation. In other words, a correction of the flat feet will be required before the closed chain exercise. On the other hand, this study had some limitations. A radiographic diagnosis was not used in the measurement of the navicular drop, and a diversity of age groups was lacking. Further studies will be needed to examine the effects of intervention for functional improvement in subjects with flatfeet. Hillstrom HJ, Song J, Kraszewski AP et al. Foot type biomechanics part 1:structure and function of the asymptomatic foot. Gait Posture 2013;37(3):445-51. Magee DJ. Orthopedic Physical Assessment. 6th ed. Philadelphia, Saunders, 2013. Atik A, Ozyurek S. Flexible flatfoot. North Clin Istanb 2014;1(1):57-64. Cote KP, Brunet ME, Gansneder BM et al. Effects of pronated and supinated foot postures on static and dynamic postural stability. J Athl Train 2005;40(1):41-6. Brody DM. Techniques in the evaluation and treatment of the injured runner. Orthop Clin North Am 1982;13(3):541-58. Neumann DA. Kinesiology of the Musculoskeletal System:Foundation for Rehabilitation. 2nd ed. Maryland Heights, Mosby, 2011. Hertel J, Gay MR, Denegar CR. Differences in postural control during single-leg stance among healthy individuals with different foot types. J Athl Train 2002;37(2):129-32. Kothari A, Dixon PC, Stebbins J et al. Are flexible flat feet associated with proximal joint problems in children?. Gait Posture 2016;45:204-10. Sung PS, Zipple JT, Andraka JM et al. The kinetic and kinematic stability measures in healthy adult subjects with and without flat foot. Foot 2017;30:21-6. Stensdotter AK, Hodges PW, Mellor R et al. Quadriceps activation in closed and in open kinetic chain exercise. Med Sci Sports Exerc 2003;35(12):2043-7. Karandikar N, Vargas OO. Kinetic chains:a review of the concept and its clinical applications. PM R 2011;3(8):739-45. Mesfar W, Shirazi-Adl A. Knee joint biomechanics in open-kineticchain flexion exercises. Clin Biomech 2008;23(4):477-82. Khademi Kalantari K, Berenji Ardestani S. The effect of base of support stability on shoulder muscle activity during closed kinematic chain exercises. J Bodyw Mov Ther 2014;18(2):233-8. Palmitier RA, An KN, Scott SG et al. Kinetic chain exercise in knee rehabilitation. Sports Med 1991;11(6):402-13. Graham VL, Gehlsen GM, Edwards JA. 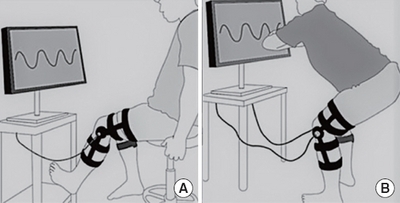 Electromyographic evaluation of closed and open kinetic chain knee rehabilitation exercises. J Athl Train 1993;28(1):23-30. Kim JA, Lim OB, Yi CH. Difference in static and dynamic stability between flexible flatfeet and neutral feet. Gait Posture 2015;41(2):546-50. McPoil TG, Cornwall MW, Medoff L et al. Arch height change during sit-to-stand:an alternative for the navicular drop test. J Foot Ankle Res 2008;1(1):3. Piriyaprasarth P, Morris ME, Winter A et al. The reliability of knee joint position testing using electrogoniometry. BMC Musculoskelet Disord 2008;9:6. Rowe PJ, Myles CM, Hillmann SJ et al. Validation of flexible electrogoniometry as a measure of joint kinematics. Physiotherapy 2001;87:479-88. Walker CR, Myles C, Nutton R et al. Movement of the knee in osteoarthritis. The use of electrogoniometry to assess function. J Bone Joint Surg Br 2001;83(2):195-8. Kwon YH, Kang KW, Son SM et al. Is effect of transcranial direct current stimulation on visuomotor coordination dependent on task difficulty?. Neural Regen Res 2015;10(3):463-6. Cho SH, Shin HK, Kwon YH et al. Cortical activation changes induced by visual biofeedback tracking training in chronic stroke patients. Neuro Rehabilitation 2007;22(2):77-84. Kisner C, Colby LA. Therapeutic exercise: foundations and techniques. 5th ed. Philadelphia, Davis Company, 2007. Cobb SC, Tis LL, Johnson BF et al. The effect of forefoot varus on postural stability. J Orthop Sports Phys Ther 2004;34(2):79-85. Tahmasebi R, Karimi MT, Satvati B et al. Evaluation of standing stability in individuals with flatfeet. Foot Ankle Spec 2015;8(3):168-74. Hertel J, Sloss BR, Earl JE. Effect of foot orthotics on quadriceps and gluteus medius electromyographic activity during selected exercises. Arch Phys Med Rehabil 2005;86(1):26-30.